Biden offered the assessment in the context of the White House’s support of allowing the George W. Bush tax cuts to expire for the wealthiest Americans while pushing the “Buffett rule” calling for those in that income bracket to pay a higher percentage of their earnings in taxes. Biden characterized Romney as “a good family man, a guy who means well,” echoing the approach that the former Massachusetts governor often takes before describing President Obama as clueless on the economy. “Part of the problem is,” Biden said, “I don’t think he just gets you, I don’t think he really understands. I mean this sincerely—I don’t think he understands what you’re all about, what makes you tick, what makes you decide to go into this profession that you couldn’t pay enough to 90 percent of the population, including me, to do what you do every day." Biden thanked the firefighters for their service, especially in the wake of last week’s deadly theater shooting in Aurora, Colo. “The American public is reminded once in a while nationally just what you do,” Biden said. The former Delaware senator also got personal when talking about what first responders mean to him and the country. He made an apparent reference to a 1972 car accident in which his wife and infant daughter were killed and his two sons were critically injured. 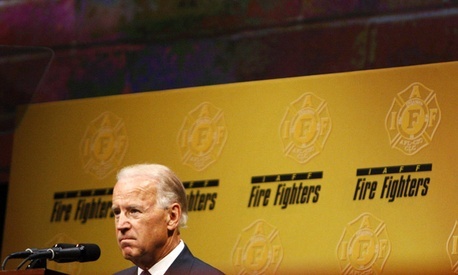 “Who shows up, like you did for my family, with the jaws of life?” Biden asked.